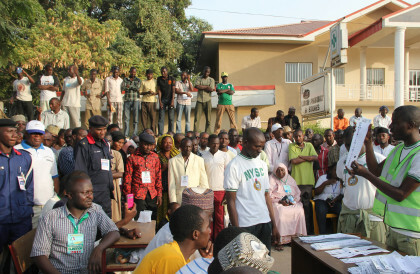 In its bid to sensitise more Nigerians on the need to fully participate in the electoral process, the Independent National Electoral Commission (INEC) in Oyo State, on Friday took its awareness campaign to Oja-Oba Central Mosque in Ibadan. The NAN reports that Mr Mutiu Agboke, the Resident Electoral Commissioner(REC) in Oyo State, led other staff of the commission to the mosque during the Jumat service. Agboke urged the Muslim faithful who were yet to register for the Permanent Voter Card (PVC) to use the opportunity of the ongoing Continuous Voters Registration (CVR) to register. He also called on those who had registered in the past but abandoned their PVCs with INEC to endeavour to collect them. ”PVC is the only power that every Nigerian of voting age has to determine who governs them. ” Nigerians must shun voting apathy and participate fully in all election processes so that our democracy can grow,’’ he said. The REC assured the people of the state that the commission would be fair to all and conduct credible elections in 2019. Agboke also said the commission would henceforth take the public enlightenment campaign to religious gatherings, motor parks and other public fora in order to educate the electorate on their rights.